Turning my eyes from an array of online wine-business ugliness, I’ve been reading Wine and Place, a “terroir reader” largely composed of extracts furthering this greatest of all wine debates. I’ll write more about it when I‘ve finished, but I wanted to now share a paragraph in a passage I found there, taken from one of the most inspiring books about wine that I know – Terry Theise’s Reading Between the Wines (University of California Press, 2010, but I see a revised edition is available on Loot; see here for my original review on Grape). I decided long ago. I profoundly accept this “something that tells you”. I even sometimes try to write about wine and wine-people and wine-places in that way, though undoubtedly not sufficiently hard, frequently or successfully. But I am aware that it is not easy to reach this sort of understanding of wine when all you have is bottles (even if you also have books like Theise’s) and don’t have much opportunity to spend real time with wine-growers, especially among the vines. Most of the great wine experiences I have had have not been with bottles of wine (although they must always be the context), but in those wonderfully humanised landscapes that are vineyards, with people. There was an unforgettable day travelling with Rosa Kruger and Eben Sadie – my first visit to isolated vineyards in the north of the Swartland and the hills of the Olifants River, vineyards whose wines would soon become world-famous, though we none of us really knew that then (though Rosa, at least was convinced, and she convinced Eben). The dishevelled century-old vines that would produce ‘T Voedpad have an immovable place in my heart (I helped harvest them once – it wasn’t much fun, and I was worried about snakes, but it deepened my feeling for the wine). The unlikely dry hillsides of Skurfberg with that red sandy soil. The chalkwhite sea-sand of Skerpioen. I cannot drink those wines now without images crowding in of those vineyards and the people who sweat over them and understand them and love them. That above all is what is in the glass. And driving up terrible farm roads with Chris Alheit to see the vines of Radio Lazarus that he worked so mightily to save, and seeing him so disconsolate as he realised (definitively that day, I suspect) that they were doomed – as indeed the drought later ensured they were. And listening to Johan Reyneke talk with such care and genuine commitment about the meaning of land and working it. And marvelling with Gottfried Mocke at raw, hard-won steep terraces planted with infant pinot noir at Chamonix. Those and so many more experiences are part of wine for me. I have sought them out, have paid willingly for these privileges in various ways, and they count as some of the great ones of my life – repeatable when I pull a cork. How could I want to taste those wines (or any wines) blind and rate them out of 100? “You decide”, says Terry Theise. I know it’s not so simple. Not everyone can phone Johannes Selbach in Zeltingen on the Mosel or Eben Sadie on the Paardeberg and arrange a lengthy, marvellous visit (though you could push your luck and try). But any winelover can do something to deepen and enrich his or her understanding of what’s in a glass. Many years ago I landed up on the bridge over the Mosel at Bernkastel, alone and without any introductions to smart vintners (and too diffident to knock on doors, which might well have opened). I’d learnt to love Mosel wines from reading Hugh Johnson’s lyrical descriptions, and I came closer to understanding them from just gazing at those walls of riesling and, later, walking a little way through the Wehlener Sonnenuhr, trickling the dark slate through my fingers, and imagining. 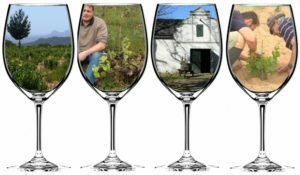 If you can visit a wineland, try wandering around a vineyard or two; history and wine culture are palpable at many old Cape estates; stand and stare, look at the people working the vines. Sometimes at a small winery especially it might well be worth expressing interest in the vineyards (so much more fascinating than a cellar tour), and someone might even find pleasure in sharing with you some of what they do and know and feel – and if you’re very lucky it will be one of those who, as Terry Theise says, have found beauty and meaning though that land, those vines. But if all you have is wine, just try gazing more deeply into it than you have before – and concern yourself less with what some critic has scored it. This is a really useful, quietly corrective piece of writing (vis-a-vis the unfolding spat). Thanks Tim for your insight and for sharing your perspective. Lovely writing as always Tim. My humble aside is that I have always found more pleasure in sharing wine with those I love; the entire experience is enhanced. Even the humble Wolftrap red, surely the most underrated of our low cost reds, is wonderful when shared with good company, great food and happiness. Tim, I’m in full agreement with everything you’ve said above in relation to tasting and drinking wines (and I feel the same principle applies to watching a live band, and listening to their music thereafter, planting a garden instead of paying someone to do it etc, etc). However, I humbly don’t think intangibles should effect the critical rating a wine is given, the practice of which, I’d argue, has (relative) value – with all due respect to the point you’ve made, [hope this doesn’t cause you to lose (more) hope in humanity ;) ]… otherwise how can comparisons be made, for the consumers who are interested in analytical, objective ratings between wines (that strip out the intangibles) if that, is what they’re after, for whatever reason – as every wine, as you’ve said, comes with a different story, and every critic has had their own unique experience aside from the glass. Obviously scoring isn’t for everyone, or every occassion, and maybe that’s why you’ve mostly refrained from giving scores online over the years (in respecting the intangibles I’d presume and possibly avoiding the headbutting too)… and with so many acclaimed critics possibly over-focussed on scoring at present, you may well be doing wine a better service in the balance of things. I do agree that wine is about the intangibles (personally I’ve done around 400 day-long wine tours, which I’d love to increase but it’s a challenge when living in Durban), however, I believe there should also be a time for the purely objective judgement of wines, for those punters who, in that moment, are interested in such a comparison… in choosing between the Magnetic North MM or the Huilkrans 2017 for example, if they can’t have both. One of the wonders of wine is that this debate will never end. Cue priceless memories… Such evocative writing, the kind that makes me want to go back to some special vineyards right now. But being in Gauteng, opening a bottle might be more practical. Brunch, anyone? Tim’s absolutely correct in theory. No one seriously scores works of art: a Kentridge at 97 and a Titian at 99, for example. The reality however is that wine is a consumable – of which the cost is partly the purchase price, but also the opportunity lost. This is what makes the insights of others useful. If it were simply a matter of relying on critics, consumers would make provision for their respective systems/calibrations, recognising that one taster’s 90 (or 18) is another’s 95 (or 18.5). It’s the marketing of these scores by producers and retailers that strips wine of the meaning invested in it by the producer. So does the fact that it has to be sold – which means that the producer/artist finally has to put a monetary value to his/her work of art, implicitly attributing more art to more highly priced bottles. In case my earlier comment is misconstrued: I think Tim has provided a salutary reminder that thoughtful/artful wine should one respected for it is, rather than simply commoditised by score/price. Ah, Michael. For me and for many people it’s not just correct in theory – it’s correct in practice; and we believe we’re the luckier ones. And I certainly won’t absolve the scorers who shrug their shoulders and blame other people for the damage done, any more than I can smile benignly at the arms dealers who don’t do the actual shooting. Kevin, I appreciate your thoughtful comments; thank you. Of course, I’m often happy to say that I think wine A is better than wine B (I do it all the time) – but I’m not happy to say that that is the most important thing to say about it, or more or less all that’s said about it (which is common). I just worry about your saying that a “purely objective” judgement is really possible or desirable. You mentioned Huilkrans and Magnetic North. I didn’t write about these 2017 Alheit wines because Christian had done so on this website and I largely agreed with his judgements. I wrote about the labels (https://winemag.co.za/tim-james-on-the-alheit-vineyards-labels/) because I think it would be wrong to abstract them from a proper enjoyment of the wines, so I wanted to bring their meaningfulness to people’s attention. I did say that, my main divergence from Christian’s notes/scores was that “I would put Radio Lazarus on the same level as the other single-vineyard wines (though leaving Huilkrans perhaps just ahead)”. So I am making those “quality” judgements. Attaching a score to them would not do much damage, perhaps, as long as I made the other “intangibles” clear. I think that’s all I’m saying. I’m really far from saying that objective quality is not a real thing; the flabbiness of saying that “good is what pleases you” is anathema to me. I’m addressing people who want to learn to understand wine, and hoping that my own experience might help one or two of them learn that there’s so much more to be said about a wine than the score and that that is the important part. I reckon Michael might agree with that – theoretically at least!